The work bowl is BPA-free which is a good thing, however there seems to be some confusion over the capacity. It is stated as a 9-Cup, but users are saying that it is not. Their saying it is only 4 cups and with the blender at 5-cups, that equals the 9-Cup capacity. To clear up the confusion I decided to go straight to the source for the answer. The agent confirmed the food processor work bowl’s capacity is 71 ounces or approximately 9 cups. The liquid max is 33 ounces or about 4 cups for thick liquids. For thinner liquids it’s just 2 ½ cups. In food processor language, the stated capacity is referring to how much “dry” ingredients the bowl can hold. But the liquid capacity is usually half that amount because filling the bowl too high with liquids will cause it to leak. The Blender carafe – is 40 ounces or 5 cups and is made of plastic, which some users found unsatisfactory since blenders usually have glass pitchers. The blender comes with a lid and a filler cap. The filler cap is used to pour liquids into the blender while the machine is running. The blender blade is secured to the bottom of the carafe so there is no chance of it falling out when you’re pouring out your food. DeLonghi recommends hand washing for the work bowl and cover and also the blender carafe. The blender function does not have the capability of a stand alone unit, so if you are a power juicer or think you’ll be using it heavily, you’d be well served to spring for a dedicated machine that offers a larger capacity and more features. Only comes with one standard size feed tube and one pusher. The competition usually have two of each. The feed tube is not big enough to fit a whole potato or a large block of cheese, which necessitates cutting these items down to size to fit. The DFP250 comes with a plastic dough blade or dough tool as DeLonghi calls it, for making yeast-based dough, so you can make your own fresh and tasty bread that is free from enhancers and additives. The only drawback is that the max capacity for dough is just12 ounces which equates to 1 ½ cups or one small loaf of bread. If you anticipate making more than that at one time, pass up on this machine. Unless of course you don’t mind making multiple batches of dough. Has a dial control with two speeds plus pulse. The speed you select depends on the type of ingredients you are processing and which attachment you are using. 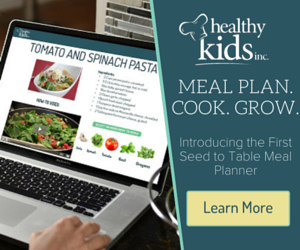 Speed #1 – when slicing or shredding soft fruits and veggies like tomatoes. Speed #2 – when using the blender function, making yeast dough or whisking egg whites. Pulse – this speed works the same on all food processors, that is it lets you control how you want the texture of your food and is used in short bursts. With only 400 watts of power, probably accounts for it not being able to handle shredding hard cheeses well and why the blender falls short when it comes to crushing ice. On the plus size, it does have a dual drive system that adjust the rotation and power to suit which ever function is being used. Serrated stainless steel chopping blade – unlike the other blades, this one is able to do many different things like cake batter and pastry dough, chopping meat, vegetables and pureeing soups. Never again buy store bought peanut butter with their hydrogenated oils and added sugar. Use this chopping blade to make your own healthy peanut butter. Stainless steel thick slice/shred disc – reversible to either slice or shred, can slice your carrots and celery to make vegetable soup. Stainless steel fine slice/shred disc – reversible to either slice or shred, can make finely shredded cheese or slice potatoes for au gratin. Detachable drive shaft – this is positioned inside the work bowl then whichever disc you are using in placed on onto it. You can purchase the following optional attachments for your DeLonghi DFP250 food processor. These extras will enhance the functionality of the product by letting you do even more with it. Twin beater geared whisk – for whipping egg whites, cream or whisking eggs and sugar for cake batter. DeLonghi recommends to only use this whisk for light batter as using heavier batter (with butter and flour) will damage it. I think I’ve covered everything about the DeLonghi DFP250 9-Cup Food Processor with Integrated Blender in the other sections of this review. It does have a couple of nice features like the cord storage which is on the base of the machine and also the interlocking safety system which prevents the machine from operating when the lid and base are not properly secured. product. They like the fact that they get two functions from one machine without the unit taking up any more space. On the downside, some users said the machine was fine when processing vegetables but struggles with cheese. Others said the plastic containers were made of cheap plastic. The blender was described as only so-so because it does not get things smooth and it’s not very good at crushing ice. Overall, more users were satisfied with the processing function than the blender capabilities. You can pick up this machine for under $90 which is a really good price for this combo unit. 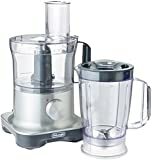 There are many inexpensive food processors and blenders on the market. Most notably from brands like Hamilton Beach and Black & Decker, that if bought separately would probably cost less than the DFP250. Being able to use two different functions with just one machine is definitely a plus for the DeLonghi DFP250. If you’re in the market for both a blender and a food processor and you don’t want to spend a lot of money or space is tight, but you still want a decent product this is a good choice. 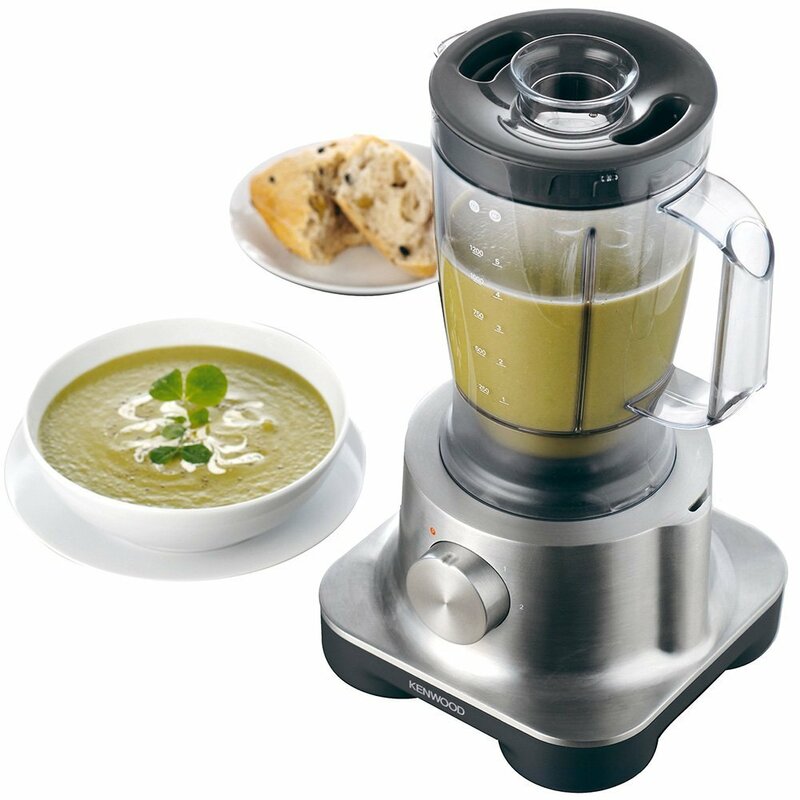 Here’s my take on the DeLonghi DFP250 9-Cup Food Processor with Integrated Blender. It has a dough blade, even though it can only make about a 1 pound loaf at a time. Compare this to the KitchenAid KFP0711cu, which does not come with a dough attachment but costs more. Also, the machine has a 400 watt motor, the KitchenAid only 300 watts. When you factor in the blender attachment, the DFP250 is beginning to look pretty good. True, it does not excel at either task, but it gets the job done. This machine could work for you if you don’t intend to do any type of heavy-duty processing or blending.